Measure, compare, and trigger lights all from a large, intuitive touchscreen display. Built-in radio power control and triggering for the 2.4 GHz Elinchrom SkyPort wireless system. Trigger, take a meter reading, and adjust the power of Skyport equipped lights with out ever leaving your subject. 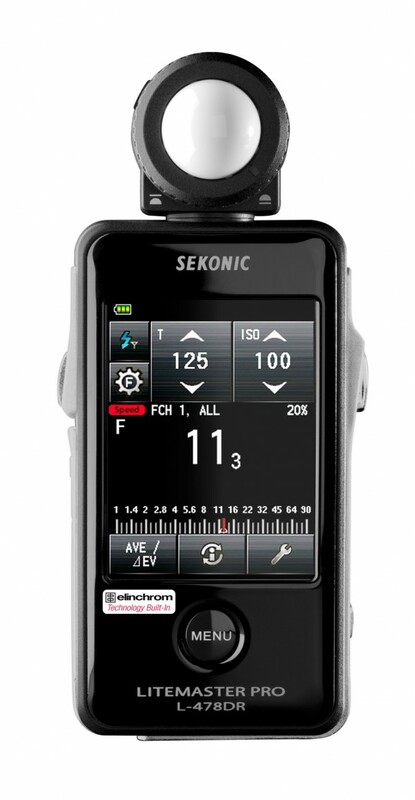 You now have the ability to control power on compatible Elinchrom strobes in 0.1-step increments. Measure and assign lights across 20 channels and 4 groups with measured values maintained so you can determine ratios and build looks. Find your preferred mix of ambient and flash to balance backgrounds or sky tones. Hybrid shooters can use these settings to gain access to frame rate selection from 1-1,000 fps as well as shutter angle settings from 1-358° as well as ISO 850 for Canon cinema cameras. Enables the meter to account for filter factor, which can now be done at up to 12 EV for landscape shooters using high-density ND filters. Great recycling time, 0.6 s to full power, integrated EL-Skyport for remote triggering and many programmable options. With lots of different accessories available, this is the great place to start. The best entry-level unit available. Great recycling time, integrated EL-Skyport for remote triggering and many programmable options. With its color and power stability, this is a great head for any photographer. Small but robust, this flash unit offers a flash duration of a 1/2200 s at full power, integrated EL-Skyport for remote triggering and many programmable options. With lots of different accessories available, this is the great place to start. An affordable multi-voltage entry professional unit with short flash duration (1/2762 s), integrated EL-Skyport for remote triggering, power, independent modelling lamp control and many programmable options. An affordable multi-voltage entry professional unit with short flash duration (1/1558 s), integrated EL-Skyport for remote triggering, power, independent modelling lamp control and many programmable options. Lightning fast recycling times (0.6s at full power! ), Swiss precision of power output and color temperature consistency and super fast flash duration (up to 1/5000s) combined in one unit. Furthermore, an OLED screen displays every control for the most professional user experience.